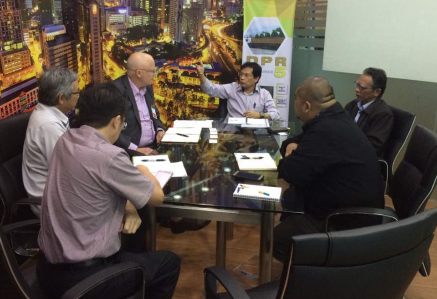 Bandar Baru Bangi – On November 24th, 2017, Mr. Mike Brooke, Honorary Fellow of the University of Melbourne, Victoria Australia conducted an interview session with TCI management before approving and embarking on internship and attachment for 2 weeks at TCI. This is part of a series of MBS exposures and co-curriculum to prepare and equip students for cross border business and work culture. Among the features of the management being the schema and attracting MBS is transformational and visionary leadership. In the interview, Mr. Mike was impressed by TCI’s strategic efforts and evidences towards increasing productivity and efficiency as well as added value that has yielded results from effective planning, production, product cost accounting to customer experiences. He also gave positive comments on the organization’s engagement, communication and high visibility which have moved TCI to a more outstanding level while maintaining credential product quality as well as industrial standard and compliance. The committees shown in monitoring the input and feedback of the Board’s consultants and decisions have succeeded in increasing the level of External Customer Survey Index (ECSI) to industry-benchmarked levels of more than 85%. 4 of MBS students will start attachment from November, 27th 2017 to December, 8th 2017. In addition to TCI, Telekom, KMPG, Blackmores and Linde Group are also selected. According to the Managing Director, previously only local institutions of higher learning and state management sent students and delegates for research, survey, benchmarking and study visits.